The Final Chapter is something of a landmark in the ‘Friday’ series, but not for the reason most would have imagined. 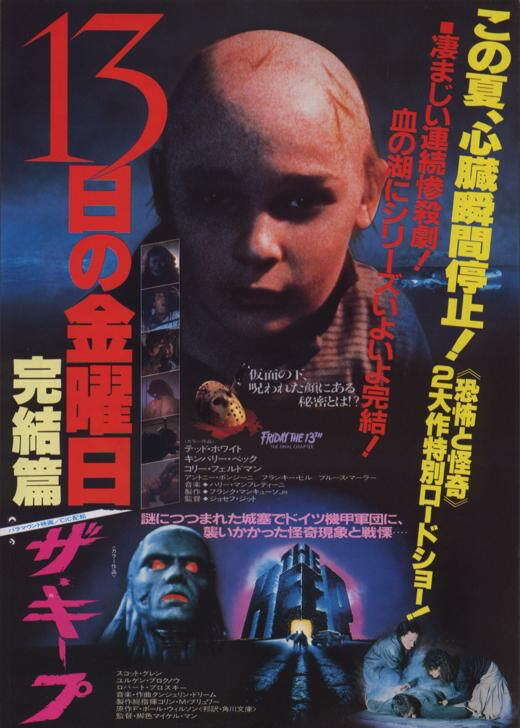 Back in 1984, the movie was advertised as the final instalment of horror’s most popular slasher franchise, one in which the irrepressible Jason Voorhees ‘finally met his match’ in the form of a practical effects whizzkid named Tommy Jarvis, but in reality this was only the beginning, or, more accurately, the dawning of a new era. By the time Part IV came to fruition, the infamous video nasty scandal had already been and gone, and the God-fearing folk at the MPAA had applied a political tourniquet on the slasher sub-genre, draining it of the colourful embellishments that had seen teenagers flock to theatres in their bloodthirsty droves. In many ways, The Final Chapter was a last hurrah for explicit, Jason-led gore. From that point onward most of the chopping would be committed on the editing floor, and fans of the genre would be met with lukewarm imitations of their favourite graphic pastime. With standards dropping and genre die-hards licking their wounds, this would surely spell the end for the hulking killer from Camp Crystal Lake. I mean, who wants to watch a series of such little imagination when the very reason for its existence has been banned outright. Jason’s latex gallery of death was the creative force driving the series. Paramount wouldn’t dream of subjecting the movie’s fan base to a watered-down version of their favourite product. This had to be the end; the proof was in the title. Rob – Jason’s body has disappeared from the morgue. Trish – It was stolen. Rob – It was not stolen. Two people at the hospital are missing. Is this coincidence? He’s alive. The Final Chapter did tremendously at the box office, raking in precisely fifteen times the $2,600,000 spent on production. What Paramount had on their hands was a stone cold cash cow, an iconic figure who had slashed his way into the hearts and minds of a generation, one whose cinematic shelf life seemed to be without limitation. Voorhees had been painted as a symbol of a morally corrupt society as critics feared for the sanity of that generation, but the truth of the matter was, times were changing, moviegoers were becoming less affected, and the preceding generation were struggling to accept their evolving environment, inevitably demonising that which was alien to them. Some of their grievances were very much warranted, particularly those which questioned the artistic merit of a sub-genre whose nihilistic business plan knew no shame, and the majority of critics probably realised that this was the movie that would influence Jason’s transition into a cheap marketing gimmick of inexhaustible value. In the end, Paramount were happy to lose the gore, but they were unwilling to put their most valuable marquee attraction to bed at the peak of his popularity, and a new angle was needed to salvage the character if he was to survive the decade. That angle came two years later in the form of seminal, meta-humour extravaganza Jason Lives!, a movie which tossed the slasher rule book down a bottomless pit and transformed Jason from a nihilistic killer into a supernatural, tongue-in-cheek monster of limitless financial potential. There were hints of that formula in 1985‘s A New Beginning, which temporarily resuscitated the franchise by introducing a copycat killer and reneging on the previous year’s titular promise. The opening of Part V featured a dream sequence in which Tommy Jarvis saw an indestructible Jason emerging from his grave to renew his infamous killing spree, a scene that would transpire in ‘reality’ only a year later. Paramount may have acquiesced with the MPAA’s artistic ruling, but they would soon have a back-up plan, a quite brilliant one, and it all began with a highly misleading title. 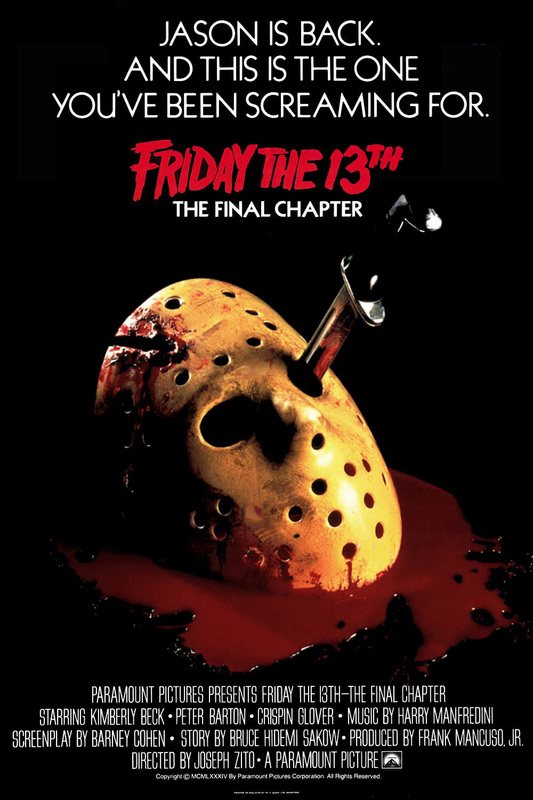 In spite of the company’s eventual reneging, The Final Chapter sets itself up as the final instalment of the series, opening with a campfire scene in which a counsellor recaps Jason’s years of wanton destruction to a group of kids who are not in the least bit perturbed by a potential recurrence. We begin where we left off, as Jason’s seemingly dead body is taken from the final scene of Friday the 13th: Part 3 to the local morgue, where Jason inevitably finds a second wind and returns to Camp Crystal Lake for more of the same. This time, Jason terrorises not only a gaggle of horny, drunken teens, but a fatherless boy and his family; residents who still live in the house across from Camp Crystal Lake, despite three previous massacres in as many years. No wonder daddy didn’t stick around! Part IV offers very little in the originality stakes besides the Tommy Jarvis sub-narrative, but compared with the rest of the ‘Friday’ sequels it is perhaps the purest example of a Friday movie, presenting Jason as the masked brute the series is now synonymous with, also offering some of the most genuinely tense moments of a franchise largely devoid of them. 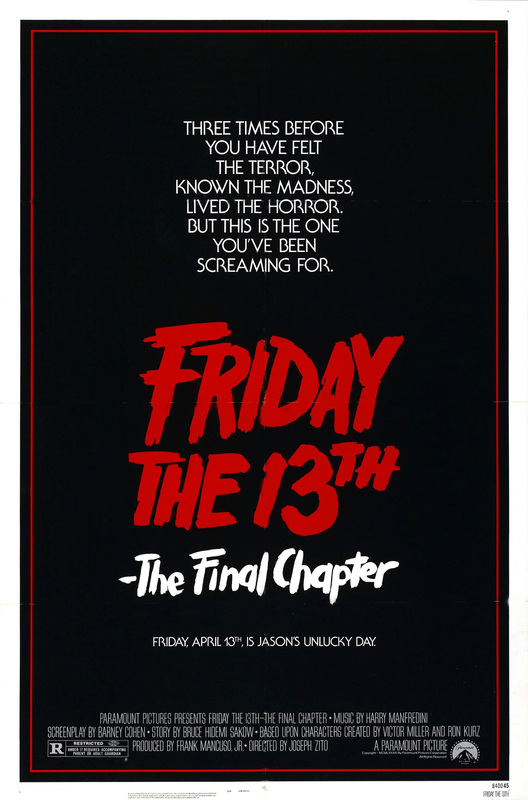 It is also the last of the original ‘Friday’ movies to feature explicit bloodshed, with Tom Savini producing some of his best work, particularly a skull-crushing death in the shower and a scene in which a sleazy doctor has his throat cut and head turned around 180 degrees, while the sight of Jason’s impaled face sliding along the edge of a machete is an iconic moment in the ‘Friday’ legacy. Doctor – [to Trish] Under extreme duress, people are capable of extraordinary behaviour. That’s what happened when your brother violently attacked the killer. At that moment, it was perfectly normal for him to act to protect himself. There is also the death of Mrs. Jarvis to consider. In the movie we don’t get to see her demise; it is suggested, but her Jason-inspired fate would occur off-screen. This particular death would prove the subject of much conflict between Paramount and those in charge of creative. Screenwriter Barney Cohen loved the idea of a maternal figure meeting her grisly end in a series where death was typically reserved for teenagers. Cohen would say of their discussions, “The idea, to me, of kids watching a mother figure being ripped, was extremely exciting. [The Audience are] used to seeing kids being punished, essentially for their loss of innocence. To see mom punished; that’s grotesque.” Instead Paramount wanted a dream sequence reminiscent of the first movie, one that sees the corpse of Mrs Jarvis floating dead in a bathtub while a machete-wielding Jason appears in the background. This scene was filmed but ultimately edited from the final cut, resulting in the most anomalous instance of censorship in the series. Mrs. Jarvis: Someone left the front door open again. Tommy: We’re in the country. Mrs. Jarvis: Well, what happens if a psycho wanders in? Trish: He’d probably challenge him to a game of Zaxxon. Ironically, The Final Chapter is just as famous for those on the end of White’s whirlwind killing spree, becoming iconic for its various cult moments and ’80s star turns. Stand By Me‘s Corey Feldman, a rambunctious child actor described by Ted White as “a mean little kid”, plays the movie’s peewee protagonist, Tommy Jarvis, and Weird Science‘s Judie Aronson makes a rather low-key appearance as a sultry, yet peripheral victim. For many, horror would peak in the 1980s thanks to the burgeoning home video market, one which led to an oversaturation of artless genre pictures, and many of the decade’s stars would find their commercial feet in horror. As an example, go back and watch golden era slasher The Burning and see how many soon-to-be-famous faces you can spot. There’s even an early role for Seinfeld‘s Jason Alexander. No wonder he became so cynical! Perhaps the most notable cult figure to appear in The Final Chapter is Back to the Future‘s George McFly, (Crispin Glover), an actor who more than lives up to his oddball real-life persona with a convulsive dance scene that would go down in horror movie folklore, all but confirming the theory that white people cannot dance, or even understand the nature of music. The era is known for its spurious moments, the kind that simply don’t exist in today’s slick production arena unless transparently self-aware. They remind us of a simpler time when the industry was not so regimented and ‘bad’ movies took on a very different, often accidental guise. Ask any Jason fan about The Final Chapter and they will invariably reference ‘the dance’, a scene of obscure charm which has become nothing short of emblematic in the slasher canon. Ironically, in many ways Part IV would prove to be the final chapter, the last instalment in Jason’s more conventional period, one free of annual gimmicks that was very much a blueprint slasher. For many fans it is the cut-off in the series, one which led to a half-decade of campy mayhem that cranked up the humour and skimped on the gore, transforming Jason into a supernatural entity who stalked his victims with a raised eyebrow. 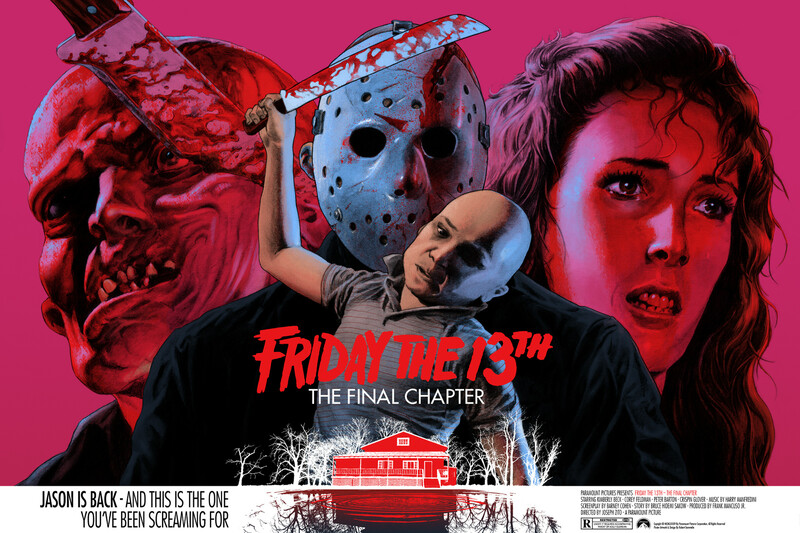 Perhaps the pinnacle of Jason’s more explicit period, The Final Chapter will always be remembered for its young stars and accidental quirks, but mostly as a landmark in the series, a censorship-imposed promise that would lead to a revolutionary period in the evolution of the Voorhees character. After the fourth instalment, Jason would become much more than a sleazy Michael Myers clone. He would become the Roger Moore of the horror genre, a self-reflexive figure of tongue-in-cheek immortality, a character who, in spite of the majority of critics’ best efforts, transcended the predictability of the ‘Friday’ formula to become one of the most memorable characters in all of horror — for better and for worse.